I wasn’t surprised when Treasurer Curtis Pitt today revealed there would be a write down in mining royalties of $3 billion over the Budget forward estimates (i.e. 2015-16 to 2018-19), due to both lower prices and volumes than previously forecast (see this Courier-Mail report). 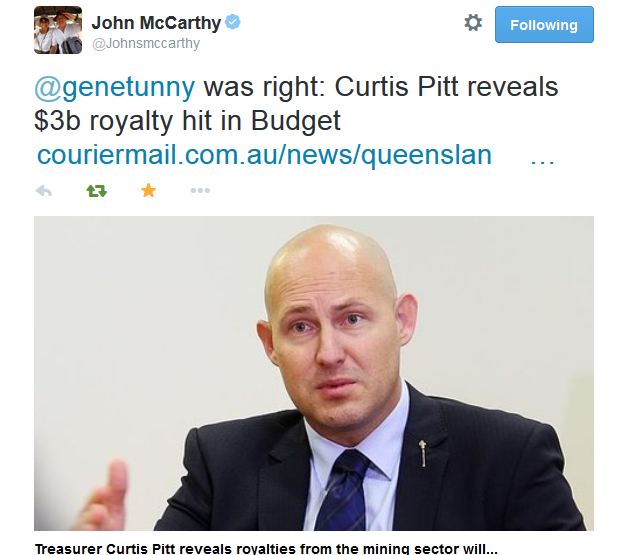 As John McCarthy of the Courier-Mail acknowledged in his tweet reproduced above, I had previously forecast a major royalties write down (see Courier-Mail story on Qld Govt’s fiscal challenges). As I’ve commented many times before, the Government faces a big (if not impossible) challenge in sticking to the fiscal strategy it announced at election time, which included a commitment to paying down debt without asset leases, albeit at a slower rate than the previous Government had committed to (e.g. listen to my ABC radio interview on the first day of the new Parliament). This entry was posted in Budget, Mining and tagged debt, fisalstrategy, mining, qld, queensland, royalties. Bookmark the permalink.